The Miners and Pyg Tracks up Mount Snowdon are popular walks. The Pyg Track is around 3 /14 miles to the summit, and the Miners 3 3/4 miles.​Thanks to Ray Jacob for his excellent advice and route description below. Both paths are manageable by persons of reasonable fitness provided you prepare properly; food, good boots, water, appropriate clothes etc. One final thing to remember, Snowdon conditions can change literally in seconds, so be prepared for all weathers! If it's your first time, try and pick a day with a reasonal mountain (not the regional) weather forecast, although there are still no guarantees what to expect. Also, make sure you will have enough daylight to complete the journey, as even for a fit agile climber it's likely to be a good 5 hours - considerably more for a novice walker or family with young children. Just take your time, its' not a race, and when you feel the need to stop and rest then do just that. When Ray walked it he wondered what all the fuss was about, it was a brilliant day and he questioned why he was carrying so much stuff, but after a light drizzle shortly after the start and sunshine towards the middle section, the cloud suddenly dropped on the final assault and he was hit by almost zero visibility. Very strong winds came out of nowhere, along with freezing rain stinging his face. If you don't need your gear, great, but if you have an experience like Ray you'll be pleased you took it with you! Although the paths are well marked, in mist it is easy to become disoriented, so a map and compass and GPS is still essential. Both paths start at Pen y Pass Youth Hostel (A4086 Llanberis Pass) but if you want to use the car park (which is expensive!) get there very early. There is a free layby car park another 1.5 miles or so on towards Llanberis but this does add another 3 miles to your walk. Another option is the Sherpa bus which stops at the Youth Hostel. Look on the Sherpa website for information - the Sherpa bus does have the option that you can ascend this route, and descend by another path. Once at the Pen Y Pass car park the Pyg Track starts by leaving via the top right hand corner of the car park. If you want to take the Miners Path, walk a few metres back towards the south east and a gate marks the start. The Miners Track is the longer of the two routes but is very gentle from the start and for much of the way. It is a very good well defined path which, after a somewhat boring start, gives some iconic views of Snowdon reflected in Llyn Llydaw (weather permitting). The downside is that it obviously has to ascend to the same height as all the other paths, so no prizes for guessing that the last section is steep and demanding, and the parth not so clearly defined as it requires some clambering over a rocky section. Which path to choose? As they both start and finish at the same place, why not go up one, and come back down the other? Both paths have some unique views, and Ray's suggestion would be to go up the Pyg and come back down the Miners. 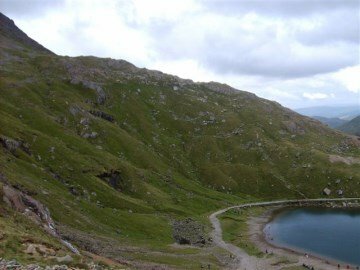 The reason being is that the descent is quicker using the Miners, and once at lake level, apart from one more minor downward scramble, the remainder of the walk is quite gentle and the path easy to follow. A good thing isf the weather conditions change or the light begins to fail. Leave the Pen y Pass car park by the top right hand corner and the path is visible before you. It climbs steadily up to pass between Crib Goch and Bwich Y Moch. The path then flattens out and offers views over Llydaw with the Miners Path now visible below as it crosses the lake by a causeway. At the fork keep left and go over the style. The right fork leads to Crib Goch which is a serious knife edge walk and not for the faint hearted. (see the description of the Crib Goch walk to see what you'd be up against!). The Pyg track continues, and the Miners Track will join from the left. If you're intending to go back down the Miners, take a note of the stone marker here. Now continue, turning right at Lake Glaslyn, and then push on upward for the second ascent section where many climbers take a rest while maybe questioning their sanity for taking on the challenge! But don't give up - it will be worth it! Eventually the path joins the Llanberis Path, and again note the stone marker at this point as it is where you will turn off to descend. Continue to the summit following (but not on) the railway line and then rest and enjoy the views, perhaps with a cuppa from the summit cafe. ​Follow the railway liine on the Llanberis path to the stone marker you noted on the way up and turn right. Again, follow the path and keep an eye on your map, looking out for the other stone marker which indicates the descent down the Miners Track. Ray advises that at first there's a scrambley descent which needs time and care, but after that it's pretty much plain sailing with just one more smaller downward scramble between the levels of lakes Glaslyn and Llydaw. The path goes along the lakes and if you look back you'll find some great views of Snowdon if conditions permit, before crossing the causeway and going away from the Pyg Track. As you pass by you'll notice some disused mine buildings, these are the buildings of the old Brittania Copper Mine. The going is now easy all the way back to the Pen Y Pass starting point. If, God forbid, you are in trouble when you reach the summit, it may be possible (subject to availibility) to get a ticket for the train down to Llanberis and then get the Sherpa bus back to Pen y Pass. But hopefully that's a last resort.